Today’s question comes from Bob. 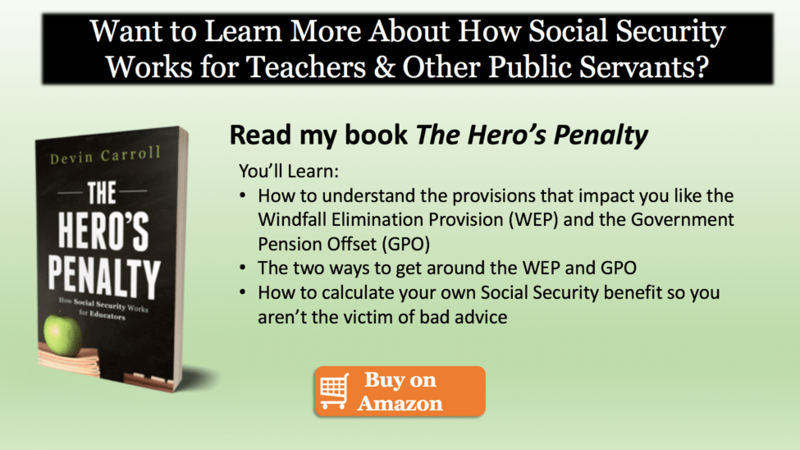 “Hi Devin, I just came across your website and found the articles on SS Windfall Elimination Provision and Government Pension Offset interesting reading. I have tried to find an answer to a question but cannot do so; even SS personnel could not tell me the answer and I wonder if you would be so kind to address. Specially, would the GPO apply in the following case. Assume a husband and wife both receive SS benefits. Assume both husband and wife receive a teachers pension. Assume one has their SS benefits reduced by the WEP. Assume the other has no WEP offset because of 30 years of social security substantial earnings. Assume the one with 30 years dies and the survivor receives that persons teachers pension. Assume the survivors own SS benefit is less than one half the deceased SS benefit. Assume the one with the substantial earnings dies. Would there be any kind of GPO for the survivor? Bob, I’m sorry you had trouble getting an answer to this question. This should have been pretty easy for the Social Security representative. Sometimes it helps if you know who to talk to at your local office. Social Security substantial earnings have NO impact whether or not the Government Pension Offset is applied. Substantial earnings only applies to phasing out the effect of the Windfall Elimination Provision. In the scenario you presented, it seems that both spouses have worked as teachers in one of the states where teachers do not pay Social Security tax. From this work as teachers they’ve each qualified for a pension. Since they’ve met both criteria (working in non-covered employment and qualifying for a pension from that work), they will each be subject to the Windfall Elimination Provision which can reduce Social Security benefits by as much as $428 in 2016. However, one of the spouses has met one of the few WEP exemptions; 30 years of substantial earnings where they paid Social Security tax. Because of these years of covered earnings, the WEP reduction will not apply. But what happens if someone dies? This is where the nasty provision called the Government Pension Offset kicks in. The GPO is applied to individuals who are entitled to a Social Security benefit as a survivor or spouse AND have a pension from work where they did not pay Social Security tax. The offset to your survivor’s or spousal benefit from Social Security is generally equal to two-thirds of your pension. For example, let’s assume that you have a teacher’s pension of $3,000 and your spouse has a Social Security benefit of $1,900. If your spouse dies, normally you’d receive the higher of your own Social Security benefit or the benefit of the deceased as a widow’s(er) benefit. However, since you have a pension from work where you did not pay Social Security tax, the Social Security Administration would offset the amount you’d receive as a Social Security Survivor’s benefit by 2/3 of your teachers pension. In this case, since 2/3 of $3,000 is greater than the SS benefit of your deceased spouse, you would not receive a survivor’s benefit. It would simply vanish. Unfair? Some think so. I tend to agree. My article on the Windfall Elimination Provision. My article on the Government Pension Offset.